Anestis specializes in both relaxing and sports massage. He has worked for well known hotels of Greece and he is very proud about his participation in the World Summer Games Special Olympics Athens 2011, as a massage therapist. 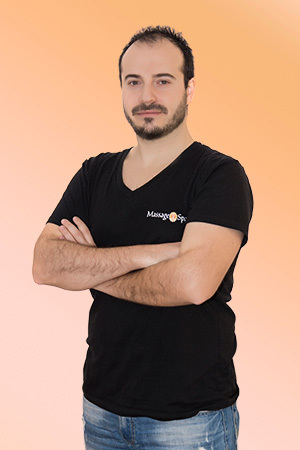 Anestis nourishes a particular passion for the art of massage and he frequently participates in seminars to expand his knowledge. A session with Anestis is never the same as the prior as he always adapts according to your body’s needs. His massages contain a combination of techniques from various massage styles like Indian, Swedish, Sports and Holistic. Using hypoallergenic oil and organic essential oils will relax your body and lift your spirit. Professionalism and consistency are some of the elements which characterize his personality. The Kalari Massage is a powerful style of massage derived from Kalari payattu martial art, which is said to derive other Asian martial arts. One of the most attractive elements of Kalari is the use of the feet, but also uses hands, fingers, forearms, elbows, knees and shins. Kalari massage combines body, mind and spirit. It strengthens the body by relaxing and opening energy pathways. It´s practice by yoguis and bodywork people. The sports massage was perfect I’ve had wonderful massages back home and I will definitely rank Anestis as one of the top therapists I’ve ever met. Next time I might try the Kalari treatment.